Sonke Gender Justice Network (2006). 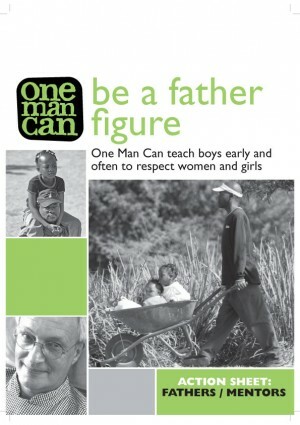 Be a Father Figure: One Man Can teach boys early and often to respect women and girls. Sonke Gender Justice Network: Cape Town, South Africa. The One Man Can Campaign promotes the idea that each one of us has a role to play, that each one of us can create a better, more equitable and more just world. At the same time, the campaign encourages men to work together with other men and with women to take action – to build a movement, to demand justice, to claim their rights and to change the world. The Campaign is a partnership between Sonke Gender Justice and many different local, national and international organisations. The One Man Can Action Kit provides men with resources to act on their concerns about domestic and sexual violence. It will be useful for any man concerned about these issues, as well as for representatives from government, NGOs, CBOs and community groups who work with men and women to address issues of gender-based violence and HIV/AIDS.